OBJECTIVE: The purpose of this study is to clarify the risk factors of decreased left ventricular (LV) ejection fraction (EF) of immediate and persistent onset after mitral valve regurgitation (MR) surgery and the potential triggers for early and safe intervention. METHODS: From January 2004 to December 2016, 346 asymptomatic patients with severe degenerative MR and preserved left ventricular function underwent surgical correction through right lateral mini-thoracotomy (RLMT). 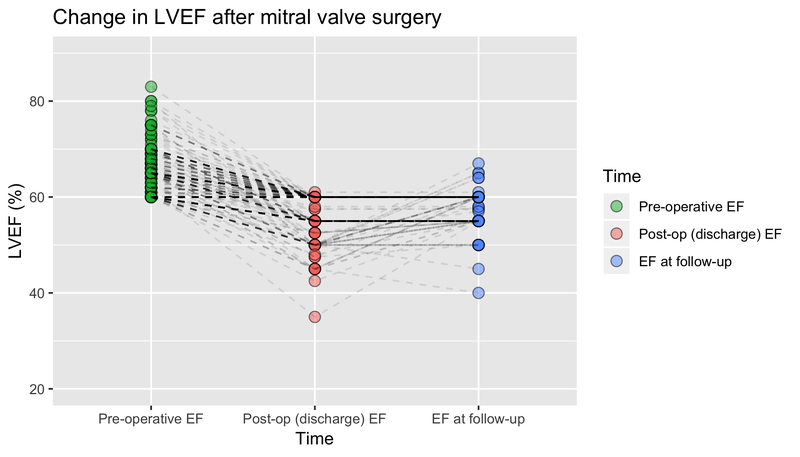 Multivariate Logistic Regression and Cox proportional hazards model were used to determine predictors of early and persistent post-operative LV dysfunction (EF < 50%) and its impact on long term survival and freedom from re-operation. RESULTS: Patients who will develop a reduction in LVEF (n=39; 11.2%), have enlarged ventricular diameters (LVEDD: 58.6±6.79 mm vs. 55±5.77 mm; p=0.003 - LVESD: 35.6±4.06 mm vs. 32±4.39 mm; p<0.001) and left atrial dilatation (LAD: 44.4±5.95 mm vs. 42.1±5.64 mm; p=0.02). Mitral repair was obtained in 95.6% of patients. There were no early deaths or significant differences in terms of common post-operative complications. At multivariate analysis, LVESD (OR 1.19; 95% CI 1.07-1.32; p=0.0014) is predictor of LV dysfunction with a cut-off value of 34.6 mm (specificity 70.9%, sensitivity 71.7%; AUC 0.71). At follow-up, 10 patients (2.89%) had persistent LV dysfunction. Survival at 1, 5, and 10 years was 100%, 99.4%, and 91.2%. Persistence of LV dysfunction was not associated with mortality, while it affects freedom from re-intervention (p=0.044). Pulmonary hypertension was the only factor with a trend towards significance (HR 6.23; 95% CI, 0.94-40.9 p=0.056). CONCLUSIONS: In asymptomatic patients, mitral repair should be considered in patients with LVESD >34.6 mm and with pulmonary hypertension.